The two-day die-off of menhaden was the result of commercial fishing activity and predation by larger fish, the Maine Marine Patrol says. 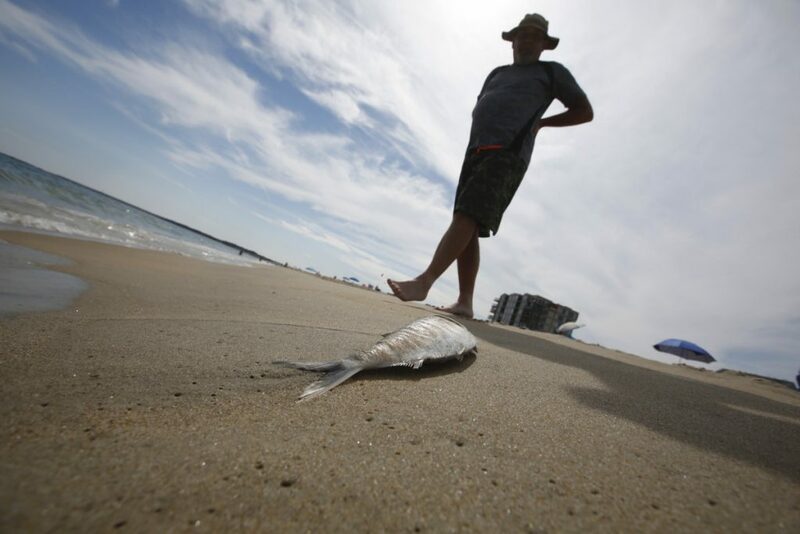 For the second day in a row, up to a thousand dead fish washed up onto the shore of Old Orchard Beach on Saturday, the result of commercial fishing activity and predation by larger fish. Maine Marine Patrol Officer Thomas Hale said about 750 to 1,000 dead fish were either on the shore or floating just offshore as of Saturday morning. The fish were spread over a large area south of the Old Orchard Beach pier near Union and Ocean avenues. It was the second consecutive day that a large number of dead fish had washed up onto the shore. Hale cited two causes for the phenomenon: fishing and predators. “It’s a combination of some discarded fish that were caught in commercial fishing operations and predation by bluefish,” he said. The Maine Department of Marine Resources has said the fish are primarily menhaden, also called pogies. The silver fish are less than a foot long. Pogies are plentiful right now and sometimes wash ashore in large numbers on some parts of the Maine coast, although the fish are not a common sight on Old Orchard’s sandy shoreline. Hale didn’t disclose which commercial fishing vessels had dumped the fish because he said the fishermen had not done anything wrong. “There was nothing illegal about what they did because the fish were released alive,” he said. It was the stress and exhaustion of being caught in a net and then released that likely caused the die-off, Hale said, adding that the dead fish were not a public health hazard. On Friday and Saturday, members of Old Orchard Beach’s public works department took the lead on cleaning the beach of dead fish, police said.